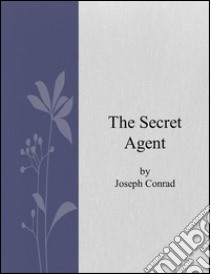 The Secret Agent: A Simple Tale is a novel by Joseph Conrad published in 1907. The story is set in London in 1886 and deals largely with the life of Mr. Verloc and his job as a spy. The Secret Agent is also notable as it is one of Conrad's later political novels, which move away from his typical tales of seafaring. The novel deals broadly with the notions of anarchism, espionage, and terrorism. It portrays anarchist or revolutionary groups before many of the social uprisings of the twentieth century. However, it also deals with exploitation, particularly with regard to Verloc's relationship with his brother-in-law Stevie. Because of its terrorist theme, The Secret Agent was noted as "one of the three works of literature most cited in the American media" around two weeks after 11 September 2001.The Secret Agent was ranked the 46th best novel of the 20th century by Modern Library.